Since the 19th Century, there has been a tradition that elves are little people that work for Santa Klaus (or some mass production food companies) who live inside trees. Those who are familiar with folklore and fantasy know that is not the always case; in fact, when Lord Dunsany wrote his celebrated, The King of Elfland’s Daughter, the first modern tale which elves appear, they still live in the legendary Alfheim (of Norse Heathenism, albeit with an Anglicized name), and they are tall enough and capable of mating with humans. Tolkien, however, would be the one to bring elves into their current level of popularity with The Hobbit (1937), followed by his Lord of the Rings Trilogy. One of the antecedents of pint sized elfs was the short story, “The Elf of the Rose,” of fabled storyteller Hans Christian Andersen. In this tale, the namesake elf was in fact the size of a blooming rose and had wings. In 1933, Snap, Crackle, and Pop made their debuts for Kellog’s Rice Crispies ads. They were however, originally identified as gnomes. Note the spellings used in this paragraph; elf aficionados have made a case that the original regular sized are elves, whereas the smaller ones are the “elfish” of the “Elfen race.” The guys clad in green who assist Santa in making (or in some stories, importing) are Elfen. In some traditions, they also works on logistics year round for the Saint’s one-day journey circumnavigating the globe. According to some folklorists including noted archivist of Scandanavian stories, Viktor Rydberg, they are headquartered somewhere between the Arctic and Lapland, as their are no reindeer for Santa to ride at the Pole itself (more on this at another date), in a secret, may be even camouflaged, village. The first mention of elves historically is in Norse tales perhaps dating back before the Aesir and Vanir House of Norse Gods. The Light Elves were said to be tall, eternally youthful, and fairer than even Nordic peoples. They lived in heavenly Alfheim. Their cousins, the Dark Elves, however, live in the bowels of the Earth similar to Dwarves. The last known monarch of the elves was Gandalf, who like his counterpart in Middle Earth, wielded a magic wand to protect his kin. Humans and Elves can have kids together with the most famous being the Half-Elf sorceress princess of Norse legends, Skuld, being the most notable. Elves similar to other preChristian entities were later demonized and thus the term “Little People” today. They were believed to cause mischief such as replacing human children with their own (though Changelings were more famous for this) to improve their bloodlines. Modern day philosophers of the metaphysics such as Robert Anton Wilson, note the similarities between alien abductions and the “spiriting away” attributed to “fairy mounds.” Wilson in fact, classified Mr. Spock, “the little green man” of Star Trek as being of the same archetype as Elves. On the latest episode of Technoccult TV, Klintron interviewed Antero Alli on a number of subjects, one of which being Robert Anton Wilson, who inspired Alli’s works, such as AngelTech. RU Sirius Show #78: Robert Anton Wilson Lives! Responding to a health scare RAW had in October, his good friend RU Sirius dedicated an episode of his podcast to wish him the best of luck and to tell him what he means to his many readers and supporters. Show #78: Robert Anton Wilson Lives! We talk about the great writer/philosopher/prankster Robert Anton Wilson with Lance Bauscher, director of the documentary “Robert Anton Wilson – Maybe Logic ” and the force behind the “Maybe Logic Academy.” And we talk to Eric Wagner, author of “An Insider’s Guide to Robert Anton Wilson .” And best of all, Bauscher brought in some reading/performances from the upcoming audio book version of The Illuminatus Trilogy!, which will be released by his Deepleaf Production company. 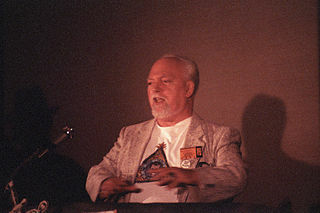 Robert Anton Wilson interviewed courtesy of GUBA.